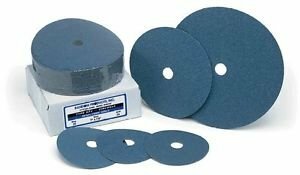 5 x 7/8 24 Grit Resin Fiber Sanding Disc, Zirconia 100/Pack by Random Products Inc at The Synthesizer. MPN: 12718. Hurry! Limited time offer. Offer valid only while supplies last. Excellent General Purpose discs for metalworking and automotive applications. Also can be used for body fillers, paint, plastics and fiberglass.